This is an easy, delicious chicken recipe whether you smoke or bake it. Enjoy the delicious mix of herbs which anyone will enjoy. The chicken thighs are inexpensive and very easy to meat providing a tender, succulent result. Mix spices and herbs well. Season all surfaces of the thighs, including the skin, using all of the herb mixture. Allow the thighs to rest for at least one hour before gas grill smoking. Place the thighs in the grill, and smoke at 225 to 250 degrees. After one hour, turn and rearrange the thighs, and be sure hopper is full of wood. Smoke for another 2 hours. Check the temperature of the thighs after two hours…thighs are done at 180 degrees. Continue smoking until the thighs are well cooked. It will take from two to five hours, depending on the grill temperature, weather conditions, and size of the chicken thighs. Brush a little olive oil on the hot smoked chicken thighs a few times while smoking. Note: If you do not want to smoke the chicken thighs, bake in the oven at 325 degrees for an hour or until the chicken internal temperature is 180 degrees. This is a great dish to take for potluck, it’s light and fresh. This zesty salad or appetizer includes no-cook shrimp combining summer ingredients, such as mangoes and avocados with a light cilantro dressing. 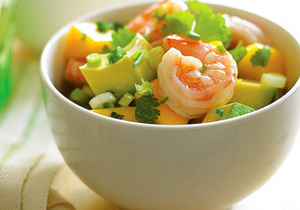 Few can resist the combo of shrimp, lime, avocado, mango, lime, and cilantro. Don’t wait to try this super easy dish. Chop shrimp into bite size pieces and set aside. Dice mangoes, green onions and avocados and place in bowl. Add olive oil, lime mice, and cilantro to bowl. Toss shrimp into bowl and serve over bed of lettuce or by itself. This recipe takes a little bit of time to prepare but it has a very nice presentation. You can use skirt steak in place of flank steak also. I like to marinate the steak to tenderize it. The balsamic reduction sauce gives it a great flavor. My favorite way to prepare is to put on the grill, smoke it for 30 minutes and then cook for 20 minutes. I like it just pink to medium. Start by preparing the marinade. Make the marinade, and pour it over flank steak in a large baggie. Refrigerate for a minimum of 3 hours. In the meantime, cut the vegetables and set aside. To assemble the flank steak with veggies, lay the flank steak out on a large cutting board. Place strips of vegetables and herbs in the center of the steak. Roll steak and secure with the wooden skewers. Place on grill and cook 20-30 minutes or place in 350 degree oven for 30 minutes. While steak is cooking, begin sautéing mushrooms with vinegar, broth,shallot and garlic. Add oil to skillet. Add the shallots and garlic until they turn soft and translucent. Add the chicken stock and stir. Allow to boil, and add mushrooms. Saute until mushrooms are soft. Remove steak from oven or grill, let meat set 10 minutes. Remove the skewers and slice in 1½ inch slices with sharp knife. Top with balsamic mushrooms. 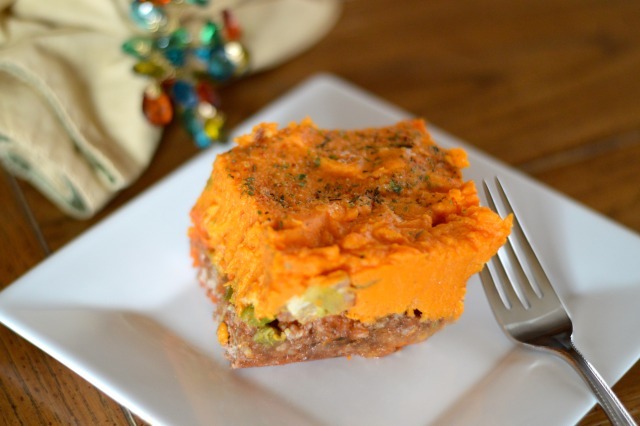 This is an amazing paleo version of the traditional shepherd’s pie. I was never a fan of sweet potatoes growing up, especially not the marshmallow laden sweet potatoes on Thanksgiving. But I love sweet potatoes now! Maybe because I know how nutritious they are for me, rich in beta carotene which helps produce Vitamin A. You can change up the recipe and use orange or white sweet potatoes. You just might fool someone with the white sweet potatoes. Enjoy this gluten and dairy free recipe. Preheat oven to 425 degrees F. Wash and dry sweet potatoes, then wrap in foil and place in cookie sheet in oven. Bake 1 hour or until soft. In the meantime, brown ground beef in large skillet. When browned, add tomatoes, tomato paste, balsamic vinegar, and seasoning. Remove from pan and place in large casserole dish or 9 x 13 inch pan. Add carrots, onions, and green beans to same skillet and saute in avocado oil until just slightly crisp. Then place on top of beef mixture. After potatoes have baked, remove foil and add to mixing bowl with olive oil, sea salt and black pepper. Whip the potatoes with a mixture or by hand. Spread atop the vegetable-beef mixture. Sprinkle Italian seasoning atop the mixture.